From left to right: Joshua Arce, Hillary Ronen, and Edwin Lindo. 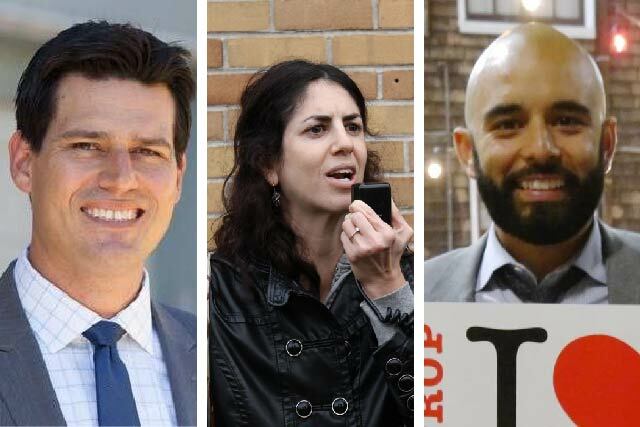 Both Hillary Ronen and Joshua Arce officially announced their candidacies for District 9 supervisor this week, joining Edwin Lindo in the race for the Mission, Bernal Heights, and Portola seat. Ronen, who has served as chief of staff for Supervisor David Campos since 2010, said she would hold an official announcement event Thursday at 4 p.m. outside of St. Luke’s Hospital. Five of the six progressive supervisors — Campos, Jane Kim, Aaron Peskin, John Avalos, and Eric Mar — plan to attend, joining former state assemblymember Tom Ammiano in endorsing Ronen. Arce quietly filed paperwork Wednesday evening declaring his intent to run before speaking to a few dozen supporters at Bissap Baobab, including Lou Fischer, recently-elected head of the Alice B. Toklas LGBT Democratic Club, and Larry Del Carlo, former Mission Housing president. Lindo held a campaign kick-off back in December and has been fundraising and canvassing since, spending his weekends meeting and greeting residents of the district. Lindo was also a vocal advocate of the Mission moratorium and is a fixture of the protest movement against police shootings. Ronen said Wednesday she is committed to seeing 5,000 new affordable housing units built in the district in the next 10 years. He was thin on specifics and endorsements, promising further details during a formal announcement event in February. “The difference is that the policy that I would be creating is through the lens of my lived experience,” he said, adding that his four months as an intern for Supervisor Campos — where he worked under Ronen — gave him the required experience. A relative newcomer to political scene as well as Mission native, Lindo is the most home-grown candidate but does not have the weighty endorsements of his opponents. Five of the six progressive supervisors are backing Ronen, who, with Ammiano’s and Campos’s endorsements, keeps alive a tradition in District 9 of incumbent supervisors mentoring their replacements. “What I’ve seen is someone who understands how city hall works, who knows what it takes to be effective, and who has a very thorough grasp of the issues,” said Campos, underscoring Ronen’s involvement in all the legislation he has passed in the last five years. Arce, on the other hand, may have heavy donors and the local Democratic machinery on his side. Labor unions are traditional allies of building developers — big spenders in city elections — and alongside his candidacy for supervisor Arce is running for re-election to the Democratic County Central Committee in June. The 2016 supervisorial elections are critical for the balance of power on the Board of Supervisors. With three of the most left-leaning supervisors — Campos, Mar, and Avalos — termed out and Peskin, London Breed, and Norman Yee up for re-election, moderates need just two wins to regain the 6-5 majority they held before the progressive victory last November. The State Senate race between progressive Kim and moderate Scott Weiner also throws a wrench into predictions of the post-election landscape. A recently devised charter amendment may ensure an election for the seat left open by whoever departs for Sacramento. But if the ballot measure fails, Mayor Lee will be able to appoint a supervisor for either District 6 or District 8 until 2018. Correction: An earlier version of this article stated that Edwin Lindo was an intern for Supervisor David Campos for “years.” He was an intern for four months, and the article has been updated. When I looked for an address online for Ronen, it was in District 8. Was that web info incorrect? If she is carpetbagging and did indeed only recently move into District 9, I’d like to see independent proof of this claim. I do believe Jane Kim and Scott Wiener are running for the state senate, not the assembly. Thank you, it’s been fixed. I predict that David Campos will be working for MEDA when he is termed out of office. Let’s pray the next Mission Supervisor is not as lazy and inept as Campos. It’s outrageous it took him two years after the epidemic of gentrification really began, to hold a hearing on evictions and displacement. Who will do the most to reduce crime, muggings, violence, and shootings in the Mission? If you like the way things are going in District 9, then you probably love this statement. Nothing changes unless something changes. Please issue a correction to this article. Not all Labor Unions “are traditional allies of building developers. ” At Ms. Ronan’s announcement event, Nurses from the Calirfornia Nurses Association, a labor union, were present to support her candidacy. Also, SEIU 1021, the city’s largest public employee union has not traditionally allied with building developers. You omitted Iswari Espana, who is also running for District 9 Supervisor. I support Edwin Lindo. He’s a lifelong Mission District resident and he understands our issues. All liars….. it’s SUBSIDIZED housing not affordable. All housing is affordable to someone.